Integrins play an important role in cell adhesion to the extracellular matrix and other cells. Upon ligand binding, signaling is initiated and several intracellular pathways are activated. This leads to a wide variety of effects, depending on cell type. Integrin activation has been linked to proliferation, secretion of matrix-degrading enzymes, cytokine production, migration, and invasion. Dysregulated integrin expression is often found in malignant disease. Tumors use integrins to evade apoptosis or metastasize, indicating that integrin signaling has to be tightly controlled. During the course of rheumatoid arthritis, the synovial tissue is infiltrated by immune cells that secrete large amounts of cytokines. This pro-inflammatory milieu leads to an upregulation of integrin receptors and their ligands in the synovial tissue. As a consequence, integrin signaling is enhanced, leading to enhanced production of matrix-degrading enzymes and cytokines. Furthermore, in analogy to invading tumors, synovial fibroblasts start invading and degrading cartilage, thereby generating extracellular matrix debris that can further activate integrins. Integrins are a large group of transmembrane proteins that anchor the cell to the extracellular matrix (ECM) or other cells. Upon binding, integrins remodel the ECM by inducing the expression of certain proteases. Integrins control cellular proliferation, migration, and invasion. Whereas in some cases integrins can mediate these effects on their own, they usually signal in the context of growth factor or cytokine receptors . Ligand binding to integrin controls adhesion-dependent proliferation, whereas unligated integrins enhance apoptotic pathways . This is one reason why dysregulated integrin expression or downstream signaling pathways can be observed in almost all forms of cancer, and integrin levels often determine the aggressiveness or propensity to metastasize. Migration, invasion, and proliferation of synovial cells are major problems in rheumatoid arthritis (RA) . This debilitating disease is characterized by an inflamed synovial tissue with a massive influx of immune cells and an inflated synovial lining consisting mainly of synovial fibroblasts (SFs) and macrophages that adhere to the adjacent ECM. These SFs are highly proliferative and contribute significantly to cartilage and bone destruction. In some aspects, they can be considered 'tumor-like' as SFs are resistant to many apoptotic pathways, show increased proliferation, and produce high amounts of matrix metalloproteinases (MMPs) because of dysregulation of the transcription factors AP-1, p53, and nuclear factor-kappa-B (NF-κB) . Fibroblasts, macrophages, but also endothelial cells in synovial tissue show high levels of integrin expression . In RA, not only integrins but also their ligands (for example, fibronectin and collagen as well as their degradation products) are up-regulated . This 'overstimulation' of cells by integrin-mediated signals increases basal secretion of proinflammatory cytokines like interleukin-6 (IL-6) and IL-8 but also levels of various MMPs [7–9]. This review introduces the predominant integrins expressed on synovial cells along with their binding partners and demonstrates their significance in disease progression. We focused mainly on the β1, β3, and β5 integrins because altered levels of their ligands and respective integrins themselves are one major factor that fuels the destruction of cartilage in RA. Although integrins influence RA significantly, only a few reviews that address integrins in RA have been published. A Medline search for 'integrins' and 'arthritis' yielded 108 (compared with 'integrins' and 'cancer' with over 1,200 reviews) reviews, most of which outlined single integrins or cell types. Two reviews in 1993 and 1995 - by Postigo and colleagues  and Liao and Haynes , respectively - were the last comprehensive articles describing the influence of integrins on the pathogenesis of RA. Both articles, however, failed to describe the intricacies in integrin biology, from the generation of integrin ligands from the ECM to the subsequent triggering of integrin signaling cascades that finally lead to the generation of pro-inflammatory factors and cartilage degradation. To our knowledge, this is the first review that demonstrates the whole integrin machinery in arthritis, including ligands, receptors, and effector cells. A cell needs to sense the composition of the extracellular environment to elicit appropriate responses. Integrins, a family of heterodimeric proteins, serve as sensors of the ECM. Integrins consist of an α subunit that determines ligand specificity and a β subunit that initiates intracellular signaling events. Whereas most integrins bind almost exclusively to ECM molecules, β2 heterodimers bind other adhesion molecules, mediate cell-cell contacts, and are important components of the immune system. In contrast to the β2 integrin, which is expressed only on immune cells, other β subunits have a much more diverse expression. In the synovium, fibroblasts, macrophages, and endothelial cells are just a few examples of cells that express the β1, β3, and β5 subunits. The ECM-binding integrins mediate cellular processes such as adhesion, migration, tissue invasion, and chemotaxis but also cytokine and MMP production. Within the protein sequences of fibronectin, collagen, and vitronectin, integrins bind to arginine-glycineaspartic acid (RGD) motives. Interaction with the RGD sequence is an important switch for integrin activation and subsequent cellular changes. Integrins can transduce signals from outside the cell to the interior and vice versa, allowing the cell to respond dynamically to a wide variety of stimuli. Growth factors, hormones, and cytokines as well as the composition of the ECM are able to modulate integrin signaling and affinity . When integrins are activated by ligands, several signaling events are initiated. Besides the focal adhesion kinase (FAK), the mitogen-activated protein kinase (MAPK) pathway, the phosphatidylinositol 3-kinase (PI3K), and c-Jun N-terminal kinases (JNKs) are activated . Growth factors and cytokines employ the same signaling pathways as integrins, demonstrating an intricate interplay between the two. Integrins are linked to the cytoskeleton by coupling to adaptor proteins such as vinculin and talin. Therefore, changes in integrin activation lead to changes in the actin cytoskeleton, a prerequisite for adhesion, migration, and invasion on ECMs. Given that various integrin combinations recognize the same ECM molecule (for example, fibronectin is recognized by α4β1, α5β1, ανβ1, ανβ3, and α3β1 and weakly by others), one would expect some redundancy in integrin function. In fact, this is the case when collagen-binding integrin subunits α1 or α2 are knocked out. When α1 is knocked out, corresponding mice show decreased vascularization, and isolated endothelial cells from these animals show reduced proliferation whereas α2 knockouts demonstrate only a subtle phenotype. The picture is different when regarding the knockout of fibronectin-binding integrin subunits. Knockout of either integrin α3, α4, α5 or αν is lethal during embryogenesis and respective mice die shortly after birth. Also, the fibronectin-binding integrins have a more tissue-specific distribution than collagen-binding integrins, making target cells more susceptible to specific knockouts. Besides having a role in development, integrin mutations lead to a variety of other defects. Leukocyte adhesion deficiency type 1 (LAD-1) is an autosomal recessive disorder based on point mutations within the β2 integrin, resulting in either its absence on the cell surface or the inability to associate with the corresponding α subunit. This leads to reoccurring bacterial infections, suggesting an impaired function of macrophages and neutrophils. Another autosomal recessive (although an autoimmune form exists) disease is the Glanzmann thrombasthenia, in which the platelet integrin αIIbβ3 fails to bind to fibrinogen and fibrin. This step is important to form blood clots after injury, and failure to do so leads to prolonged bleeding. Integrins are also involved in the generation and perpetuation of cancer. In several tumors, expression of specific integrin subunits is associated with malignancy. In melanoma, increased expression of ανβ3 and α5β1 promotes vertical growth and lymph node metastasis. In non-small-cell lung carcinoma, high α5β1 levels predict decreased patient survival. In general, alterations in integrin activation or expression promote tumor growth and metastasis. However, in some cases (for example, α2β1 in breast cancer), integrins can be protective by decreasing cell dissemination . This integrin increases differentiation of epithelium and enhances ECM binding, thus decreasing migration. When the integrin distribution in the synovial tissue is analyzed, several factors need to be considered. First, integrin expression and function differ depending on cell type. Second, the location of the cell is important as expression levels differ at the synovial lining compared with the sublining. Every cell in the synovial tissue expresses a specific subset of integrins, depending on lineage and origin. Several groups have investigated synovial tissue samples and isolated cells to study integrin expression. The integrin subunit β1 is most widely expressed since it can be found on macrophages, lymphocytes, endothelial cells, and fibroblasts [5, 15, 16]. The fibronectin receptor α5β1 and the laminin receptor α3β1 were also found on every synovial cell type, whereas α4β1, which besides fibronectin also binds VCAM-1, was found only on lymphocytes. Endothelial cells and fibroblasts also express the collagen receptor α1β1 and the vitronectin receptor ανβ3 . In synovial tissue, integrin expression also depends on the location of the particular cell. Expression of most integrins is similar throughout the synovial tissue but is different at the synovial lining layer . This is the area where synovial cells adhere to cartilage and activated fibroblasts and macrophages degrade ECM and invade cartilage. The laminin receptor α6β1 is expressed by fibroblasts at the lining layer but not by macrophages, which usually express this receptor . At the synovial lining, we found an increase in α5, αν, and β1 integrin levels compared with the sublining area. This clearly indicates that increased integrin expression is associated with a more 'destructive' phenotype of the corresponding cell. Figure 1 depicts the integrin-ligand interactions and their consequences (for example, proliferation and secretion of pro-inflammatory mediators) described in the next three sections. 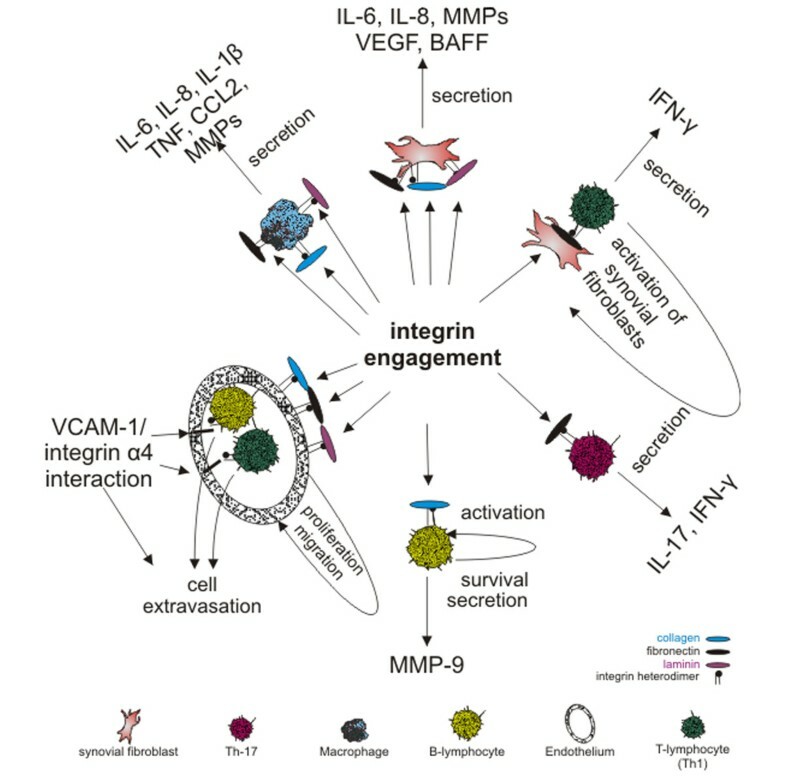 The most important cell types (fibro-blasts, endothelium, T cells, B cells, macrophages, and Th17 cells), including their individual reaction to integrin engagement, are depicted (Figure 1). The individual integrin levels on each cell type are presented in Table 1. This table reflects our own observations of tissue samples stained for individual integrins and flow cytometric analyses as well as literature data. Engagement with fibronectin-, laminin-, or collagen-binding integrins leads to the production and secretion of pro-inflammatory factors. Binding is indicated by the arrows. Cell type, ligand (for example, fibronectin or fibronectin-derived peptides), ligand occupation, and integrin expression level determine the cellular response. BAFF, B-lymphocyte activating factor; CCL2, chemokine (C-C motif) ligand 2; IFN-γ, interferon-gamma; IL, interleukin; MMP, matrix metalloproteinase; TNF, tumor necrosis factor; VCAM-1, vascular cell adhesion protein 1; VEGF, vascular endothelial growth factor. For most integrins, expression level data in the literature are given as 'high' or 'strong'. This makes it hard to estimate integrin levels on different cell populations. We consulted several publications and, albeit subjectively, categorized integrin expression levels on a range from strong to weak expression (indicated by one, two, or three plus signs). ?, There is no available data in the literature about the expression of respective integrins. Collagens are widely expressed in synovial tissue, and, during the course of RA, a significant proportion of patients develop antibodies against at least one collagen subtype. The collagens II, IX, X, and XI are restricted to cartilage, whereas all other forms can also be found within the ECM. The classical collagen-binding integrins rely on the triple-helical structure for binding . However, if collagen is proteolytically degraded, RGD sequences are exposed and other RGD-binding integrins can bind. In this case, ανβ3, αIIbβ3, and α5β1 can be activated by collagen-derived RGD sequences . Four different integrin combinations recognize native collagen: α1β1, α2β1, α10β1, and α11β1. Integrin α10β1 is important for chondrogenesis, whereas α11β1 has a role in the recognition and organization of interstitial collagen matrices during development. During the course of arthritis, only α1β1 and a2β1 seem to play a role; this is because these are the two major collagen-binding integrins in the synovial tissue. Although all of the above-mentioned subunits bind to collagen, their respective specificities differ for each collagen subtype; for example, integrin α1 preferentially binds collagen type IV. The integrin α1 was found to be expressed at the synovial lining and in blood vessels of arthritic joints. Interestingly, expression was increased compared with osteoarthritis and trauma controls, suggesting that the pro-inflammatory milieu in RA promotes integrin α1 synthesis . However, our group also found an increase of this adhesion receptor on synovial fibroblasts after treatment with cortisol . An increase of α1 - in analogy to integrin α5, which is also upregulated by cortisol - potentially increases adhesion to collagen. Owing to cortisol action, the increase in integrin expression is uncoupled from integrin signaling because intracellular signaling pathways are silenced by glucocorticoid treatment. Lymphocytes also express integrin α1, but only synovial lymphocytes show increased expression of this receptor . One important modulator for α1 levels is tumor necrosis factor (TNF) because anti-TNF therapy reduces the number of α1-positive effector memory T cells that contribute significantly to inflammation by producing large amounts of interferon-gamma (IFN-γ). Besides adhesion to collagen, α1 mediates several other effects, depending on cell type. On endothelial cells, vascular endothelial growth factor (VEGF) strongly upregulates α1, which is a prerequisite for the formation of new blood vessels. Inhibition of the integrin/collagen binding by specific antibodies reduced the formation of new blood vessels but did not alter pre-existing vasculature . As angiogenesis is important for the progression of arthritis, its inhibition could be an attractive target in the therapy of RA. Engagement of integrin α1 on macrophages and T cells stimulates migration and cytokine production . The role of α1 on synovial fibroblasts has not been elucidated yet, but studies from dermal fibroblasts suggest that α1 controls collagen synthesis, migration, and proliferation on collagen substrates. In a murine anti-collagen II antibody-induced arthritis model, inhibition of integrin α1 reduced cartilage degradation and leukocyte infiltration, demonstrating an important role for this integrin in inflammation . Integrin α2β1 has functions similar to those of α1β1 (for example, VEGF-induced proliferation of endothelial cells) but is much weaker in expression in the synovial tissue. Ligation of α2β1 by collagen type I or II, but not collagen type IV, augmented IFN-γ production in T cells. In contrast to CD4+ and CD8+ T cells, which upregulate α1β1 after activation, Th17 cells upregulate α2β1, which is thought to be a co-stimulatory molecule necessary for IL-17 production . In a model of experimental autoimmune encephalomyelitis, an antibody against α2 suppressed clinical signs and central nervous system inflammation because of reduced extravasation of immune cells. Since leukocyte infiltrates also fuel synovial inflammation, one would expect that α2 inhibition might also be beneficial in the joint. Laminins are a major component of the basal lamina and usually are secreted by epithelial cells, endothelium, and organogenic fibroblasts. Laminin is a trimeric molecule consisting of an α-chain, a β-chain, and a γ-chain that can combine to form 15 different laminin isoforms . Several integrin heterodimers recognize laminin as a ligand, but the affinity for each laminin subtype differs. Laminin binds to integrins α3β1, α6β1, α7β1, and α6β4, but only the first two are present in the synovial tissue. In the synovial tissue, α6β1 is strongly expressed in the synovial lining layer by fibroblasts, whereas α3β1 is also expressed by lymphocytes, macrophages, and endothelial cells . Not only the number of laminin receptors but also the production of laminin itself is upregulated in the synovial lining. Besides endothelial cells, SFs produce and secrete laminin, and its deposition at the synovial lining is increased in RA . Along with collagen and fibronectin, laminin promotes adhesion and proliferation of synovial cells and lymphocytes. Furthermore, integrin binding to laminin increases the expression of MMP-3 and MMP-10, which is further augmented when transforming growth factor-beta (TGF-β) is present . Although no studies have focused on the contribution of laminin and its respective integrin receptors on the progression of RA, results from tumor research indicate that upregulation of α6β1 or α3β1, at least in most cases, increases cell invasion and metastasis. As a consequence, increased laminin deposition and increased integrin expression on synovial lining cells increase MMP secretion by these cells, resulting in greater joint damage and invasion into cartilage. Fibronectin is a large glycoprotein consisting of two monomers linked by disulfide bonds. Owing to alternative splicing, fibronectin exists in 20 different isoforms. The molecule is folded into globular domains, each of which has a different function. In these domains, repeating amino acid sequences form the so-called type I, II, and III repeats. These sequences interact with other proteins; for example, type I repeats bind to fibrin, and regions in type III repeats contain the RGD motive that binds integrins. Fibronectin can be divided, on the basis of solubility, into two classes: soluble plasma fibronectin and insoluble cellular fibronectin, the latter of which is organized into fibrils as a scaffold for the ECM . Fibronectin levels are elevated in cartilage and synovial fluid of patients with osteoarthritis, whereas in RA, fibronectin is highly expressed at the synovial lining and invading pannus . About 12 integrin heterodimers bind to fibronectin but only some combinations are found in the synovial tissue. The classical fibronectin receptor α5β1 recognizes only fibronectin, whereas ανβ3 and ανβ5 also bind to other ECM molecules or cellular proteins. The α5 integrin is expressed by all cells in the synovial tissue, and α5 levels are increased in the synovial lining layer . Lymphocytes have been shown to attach to other synovial cells by binding to the fibronectin coating on their cell surface by α4β1 and α5β1 and to some extent by ανβ3 integrins . Adhesion to fibronectin increases proliferation and survival of chondrocytes and protects synovial cells from Fas-induced apoptosis . In addition, Zeisel and colleagues  found an increase of MMP-3 production by SFs after stimulation with a bacterial ligand of α5β1, suggesting that enhanced integrin ligation increases joint destruction in RA. Matrix-degrading enzymes in synovial fibroblasts are induced by small integrin-binding peptides derived from the degradation of fibronectin and other ECM molecules. Werb and colleagues  demonstrated that only fibronectin-derived fragments, but not intact fibronectin, increased the expression of MMP-1 and MMP-3. Besides having a role in cell survival and proliferation, α5β1 also regulates cytokine and growth factor production. In SFs, ligation of α5β1 increased synthesis of B-lymphocyte activating factor (BAFF) . Increased BAFF synthesis not only promotes the proliferation of B cells and immunglobulin class-switching but possibly acts as an autocrine mechanism of SFs to stimulate their own NF-κB activity. Besides BAFF, direct ligation of α5β1 induces the expression of NF-κB-controlled genes in fibroblasts and endothelial cells. Most of these genes - like IL-8 and heparin-bound epidermal growth factor (HB-EGF) - or endothelin-1 control angiogenesis or inflammation and their enhanced expression aggravate RA. Naïve and memory T cells depend on binding of a4β1 and α5β1 to fibronectin to promote proliferation . In this context, SFs assist in T-cell activation, as T cells bind to the fibronectin coating on their surface and α4β1 transmits co-stimulatory signals. In RA, infiltrated T cells in the synovial tissue display higher surface levels of α4β1 compared with peripheral T cells and localize to sites of tissue injury by binding to proteolytically degraded cartilage fragments. The most important function of α4β1 on lymphocytes is adhesion to endothelium and subsequent transmigration to sites of injury. Unfortunately, extravasation of lymphocytes into the synovial tissue is also the mechanism that further supports the inflammatory process. In RA, endothelium expresses high levels of VCAM-1, which acts as a binding partner for α4β1. After chemokine-induced activation and clustering of α4β1, lymphocytes are immobilized on endothelium and transmigrate to sites of inflammation . The important role for integrin α4β1 in RA is further underlined by a study by Raychaudhuri and colleagues , who show that antagonism of this receptor prevents inflammation and MMP production in a murine model of accelerated collagen-induced arthritis. Heterodimers containing αν are another family of fibronectin-binding integrins. A polymorphism in the gene coding for integrin αν is associated with RA in the European Caucasian population . The integrin ανβ3 binds fibronectin with high affinity and acts in concert with α5β1 to arrange fibronectin matrices . Besides binding fibronectin, ανβ3 binds vitronectin, osteopontin, and bone sialoprotein with high affinity. This integrin heterodimer is expressed on SFs, endothelial cells, and osteoclasts . Not much is known about the specific role of ανβ3 on SFs, but studies from other cell systems and from tumor research indicate that this integrin promotes tissue invasion and MMP-2 production. The major function of ανβ3 (and also of ανβ5) together with vascular endothelial growth factor receptor 2 (VEGF2R) is angiogenesis promotion . Integrin ανβ3 does so by phosphorylating intracellular residues of the VEGR2R, thereby enhancing signaling of this receptor. Whereas the expression of ανβ3 is low on resting endothelium, levels increase with inflammation and tumor angiogenesis. In RA, the pro-inflammatory milieu promotes angiogenesis, and its inhibition by a small-molecule αν antagonist was efficacious in a rabbit model of arthritis. Whether this is applicable to humans remains to be seen as the development of vitaxin, a monoclonal antibody against ανβ3, was discontinued in 2004 because the drug lacked efficacy in RA. It could well be that vitaxin is only minimally effective by itself but potentiates the effect of other therapies. This phenomenon is evident with cilengitide, a small-peptide αν antagonist that is being clinically tested against a variety of cancers. This peptide not only inhibits angiogenesis but also increases the permeability of endothelium. This could be exploited to increase the delivery of other drugs . Another cell type that responds to αν antagonists is the osteoclast. In RA, osteoclast activity is enhanced because of increased RANKL (receptor activator of NF-κB ligand) expression, and osteoclasts are responsible for bone erosions in RA . The integrin ανβ3 increases the bone resorptive capacity of osteoclasts by activating several intracellular signaling pathways such as FAK and c-Src. Blockage of this integrin was protective in vitro. In contrast to all of the abovementioned integrin heterodimers, β2 integrins bind other adhesion receptors and are expressed exclusively on immune cells. The focus of this section is the αLβ2 integrin (lymphocyte function-associated antigen 1, or LFA-1). This is the major integrin of leukocytes and is important for tissue extravasation, chemotaxis, and formation of immunological synapses. The ligand for LFA-1 is intracellular adhesion molecule (ICAM), which is expressed in three different isoforms. ICAM-1 is expressed in the synovial tissue by endothelial cells and fibroblasts, and cell surface levels of this glycoprotein are increased by the action of cytokines like IL-1β. As the pro-inflammatory milieu in RA also leads to the upregulation of αLβ2 on leukocytes, the net effect is an enhanced influx of immune cells in the synovial tissue, contributing significantly to inflammation. Increased cell-cell contacts between synovial fibroblasts and T lymphocytes lead to the activation of fibroblasts and result in an increased cytokine production by both T-cells and fibroblasts. This effect was dependent on T-cell adhesion on fibroblasts as T-lymphocyte cell culture supernatants failed to elicit appropriate responses . Furthermore, αLβ2 is part of the immunological synapse between antigen-presenting cells and lymphocytes, and disruption of this interaction leads to immune impairments. Owing to its importance, LFA-1 is a suitable target for therapeutic intervention, and inhibition of this integrin by a mononclonal antibody was efficacious in a rabbit model of RA . The positive effect of LFA-1 inhibition was also shown in mice treated with a small-molecule antagonist against this integrin. Animals showed reduced adhesion of T-cells to endothelial cells, reduced T-cell proliferation, and decreased Th1 cytokine production . In humans, efalizumab, a monoclonal antibody against the αL subunit, was withdrawn from the market as serious side effects occurred because of the immunosuppressive action of the drug . A more feasible approach to dampen the activity of lymphocytes in RA is the inhibition of ICAM-1. Mice deficient in ICAM-1 showed only minor disease activity in a collagen-induced arthritis model, and clinical studies in humans also demonstrated beneficial effects when ICAM-1 was blocked by an anti-ICAM-1 monoclonal antibody in early RA [48, 49]. Unfortunately, this antibody could not be administered repeatedly, as its mouse origin makes this antibody immunogenic, resulting in side effects such as fever and leukopenia . During the course of RA, immune cells are recruited into the synovial tissue, where they produce large amounts of pro-inflammatory cytokines and interact with residential fibroblasts and macrophages. The rate of migration of immune cells into the synovium is controlled by the expression of ICAM-1 on endothelial cells and integrin αLβ2 on immune cells. The interaction of T lymphocytes (Th1 type) with synovial fibroblasts, endothelial cells, and macrophages activates those cells and they start to produce ECM proteins, cytokines, adhesion molecules, and matrix-degrading enzymes. The pro-inflammatory milieu also increases the expression of most integrin subunits. The combination of increased integrin expression, increased ECM deposition, and degradation along with high cytokine and growth factor levels in the synovial tissue make a perfect microenvironment for the perpetuation of RA. The enhanced integrin signaling in RA is probably one cause of the high basal secretion of cytokines from fibroblasts and macrophages. Furthermore, increased integrin ligation enhances growth factor and cytokine signaling and induces the expression of MMPs. MMPs degrade ECM molecules, thereby generating small RGD peptides, which further activate integrins. When all the facts are taken together, it can be said that RA is, at least in part, an integrin-driven disease that can be modulated with specific integrin antagonists.